Hi friends! How was your weekend? Thankfully, I was able to get a few things done around my apartment and now am feeling much better about the state of the place. It's starting to actually feel like mine. Hooray! Also over the weekend I finally got around to planting my peony bush. I bought it a week ago and just 3 days ago, I transplanted it to a nice sized pot and added some annuals around the rim of the pot for extra color. I love how it looks. Here's to hoping it actually blooms! ;) (The garden center at Lowe's assured me it would, even in a pot! Just keep it in partial direct sun and water a little every day to every other day.) I forget the name of the variation I got, but the blooms above are my favorite type of peonies, called coral charms. I made that above bouquet for Easter a few weeks ago and it's one of my favorites to date. 1. Quickly process the flowers. Don’t worry if the leaves appear a little limp. They just need some water to perk up! 2. Peonies will usually arrive wrapped in paper. Carefully remove and put the paper wrap aside. 3. Fill up a clean container or vase with at least 3” to 4” of room temperature water. 4. With sharp floral shears, cut at least ½” to 1” off each stem at a diagonal and quickly place it in the water. You’ll want to make sure you remove any foliage that falls below the water line. 5. 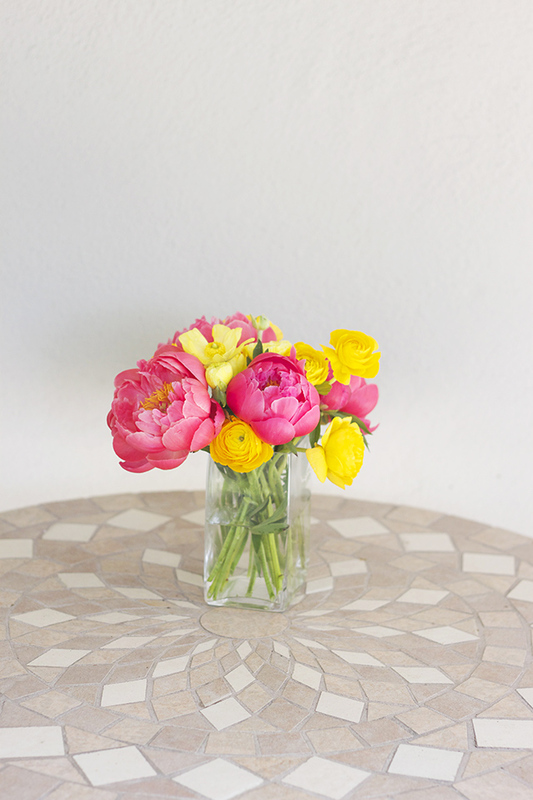 After you’ve cut each stem, Flower Muse recommends re-wrapping the paper around the peonies. Depending on your container, you can wrap around the whole vase. 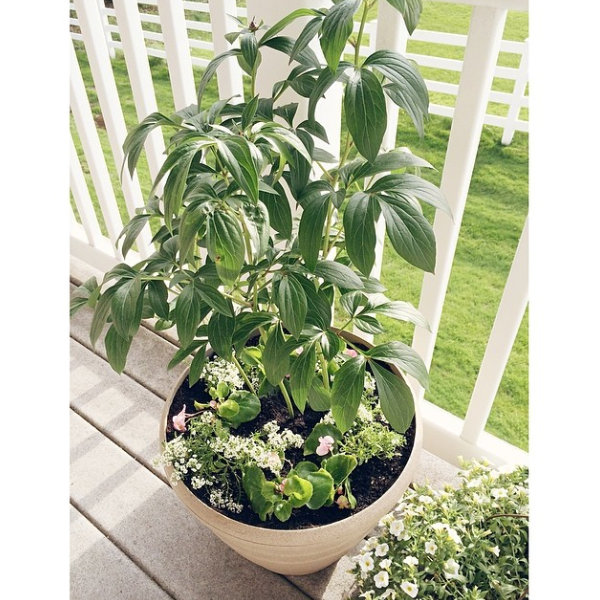 This is not necessary, but wrapping around the peonies keeps them upright and enables them to hydrate better. 6. You can remove the paper wrap after 3-4 hours. 7. The rate at which the blooms open will vary and depend on a variety of factors. Some peony varieties (e.g., coral charm) open quickly, while others may take a few days to start. The temperature of the room they are kept in will also affect how quickly they open: warmer room = faster open rate. 8. You’ll want to keep an eye on the water levels as peonies can drink quite a bit of water so you may have to re-fill the vase often. Also, you’ll want to clean and refill the vase and re-cut the stems at least every 2-3 days to maximize vase life. Do you have any good tips for keeping blooms alive longer? Do share! You will love it. We have several, and the blooms are always my favorite thing about spring. Michaela, I planted three baby peony bushes from a local garden shop at my house three years ago. That same year, my Dad planted two bushes from Lowe's at his house. He got a few blooms each year, but I sadly did not. After two years of no blooms at my house, all three of my bushes finally bloomed this spring! Apparently, when they're young, they take a little while to mature and actually bloom. Although Dad only got a few blooms each year with his, he got a TON of blooms this year. They were gorgeous! Just wanted to let you know so that if it wasn't quite what you were expecting the first couple of years, you'd wait it out. Good luck! I love those flowers! They're so gorgeous! I think I may need to go to Lowe's soon and get me one of these! Peonies are my favourite! I planted 3 in my garden this year but they were babies so I know they won't be flowering for a few years as yet but I can't wait until they do!